Demi Lovato's fans have been tweeting their support to Lovato as the singer recovers from an alleged drug overdose. At the end of June, Demi Lovato released a single titled "Sober" where she confesses, "I'm not sober anymore" and apologizes to family and fans she wanted to be a role model for. Yesterday, the 25-year-old singer was hospitalized for an alleged drug overdose. Representatives for Lovato report she is now awake and recovering. While other pop stars have covered up struggles with addiction and mental illness by talking about exhaustion or stress, Lovato has constantly been open about her personal experiences struggling with sobriety for six years. She told NPR last year about her lowest point. "Rock bottom hit me in a moment where I was drinking vodka out of a Sprite bottle at nine in the morning on my way to the airport, and I actually threw up in the back of the car service," Lovato said. "I had a moment where I thought to myself, 'Wow this is no longer glamorous. This is no longer a young person having fun with drinking and alcohol and experimentation.'" In this time, thousands of her fans have showed support for Lovato on social media and shared stories about how Lovato's honesty and openness has helped them over the years. 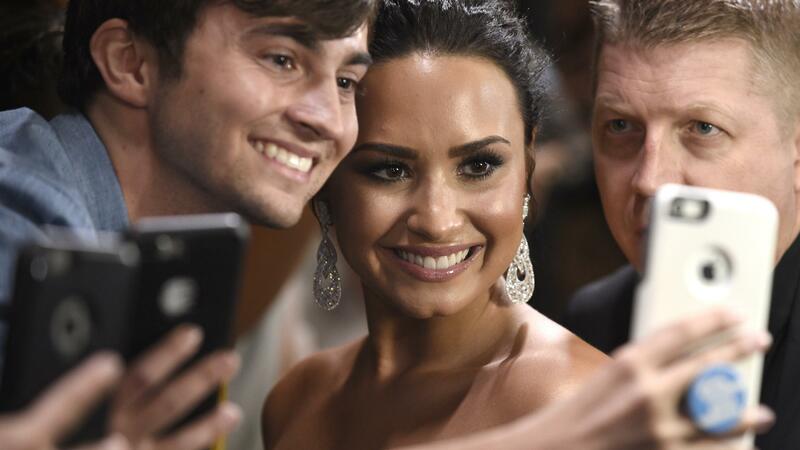 NPR's Ari Shapiro talks with BEAT Magazine editor Michael Cragg about Lovato and social media's role in furthering the open discussion about struggles with addiction and mental health. Read the edited conversation below and listen at the audio link. I want to start by talking about the reaction to Demi Lovato's apparent overdose because it's been just an outpouring of support that we have not always seen in cases like this. There's a hashtag on Twitter at the moment called #HowDemiHelpedMe, and I was looking through some of those earlier, and I think it's an example of that sort of dialogue she's had with her fans from the very beginning through how honest and open she has been about her struggles, ranging from depression to eating disorders to addiction. And I think what we're seeing now in this outpouring is fans giving back to her when obviously she needs it. Just to give one example of one of those tweets. One person wrote, "Her music has been there with me in waiting rooms before counselling, her music has been there for me in all my hospital stays. She has been there for me in my dark times and I am so grateful for her." This is so different from what we've seen in cases where I'm thinking, for example, Britney Spears or Amy Winehouse struggled with similar problems and were not treated very sympathetically. Social media has completely changed the pop landscape. There was no outlet for these pop stars to even sort of go against what was being said about them in gossip columns or in tabloids. They had no means to immediately put these things to rest. And obviously things were very different in terms of ... You were living your dream to be a pop star at that point. You were meant to be this kind of robotic, glamorous, pop entity that wasn't really a human being. It was like a form for us to escape through your music, and you were there on the stage living your best life, and we all wanted to be you. But that isn't like that anymore. It's changed completely. Pop stars now need to make it very plain they are human beings who will fail and have frailties. Demi Lovato's transparency has also come through in her music. She released a song earlier this year called "Sober" where she talks about relapsing. It's such a contrast with all the pop songs about getting drunk and wasted, partying, forgetting what you did the night before because you were so blackout. We live in a culture of sort-of open letters where that's how people started to communicate their true emotions through these sort-of open letters and taking screenshots of the Notes app on their phone to give away their true emotions on something. Yes, exactly. And I think this song is an open letter in song form. It's a literal apology going through her family, her friends, her fans, who know that the journey she's been on already. They're invested in that story and so, it was her way of telling them she had failed and that she was sorry. But it's an incredibly moving thing to hear someone detailing it like that. But also, for her fans to sort of accept that because that's what they're used to from her. It's always been there in her music. Thousands of fans of Demi Lovato are showing support for the singer. Yesterday the 25-year-old was hospitalized after an alleged drug overdose. Her family reports she's recovering. While other pop stars have covered up struggles with addiction and mental illness by talking about exhaustion or stress, Lovato has been open about her personal experience. Here's part of her conversation with my co-host Ailsa Chang last year. DEMI LOVATO: Last year rock bottom hit me in a moment where I was drinking vodka out of a Sprite bottle at 9 in the morning on my way to the airport. And I actually threw up in the back of the car service. And I had a moment where I thought to myself, wow, this is no longer glamorous. This is no longer a young person having fun with drinking and alcohol and experimentation. SHAPIRO: Joining us now is Michael Cragg. He's a music journalist and editor of Beat. Welcome to the program. SHAPIRO: I want to start by talking about the reaction because it's been just an outpouring of support that we have not always seen in cases like this. CRAGG: Yeah. I was looking at - so there's a hashtag on Twitter at the moment called #HowDemiHelpedMe. And I was looking through some of those earlier. And I think it's just an example of that dialogue that she's had with her fans from the very beginning with - through how honest and open she's been about her struggles, you know, ranging from sort of depression to eating disorders to addiction. And I think what we're seeing now is this outpouring is fans kind of giving back to her when obviously she needs it. SHAPIRO: Just to give an example, one of these tweets says, her music has been there with me in waiting rooms before counseling. Her music has been there for me in all my hospital stays. She has been there for me in my dark times, and I am so grateful for her. This is so different from what we've seen in cases where - I'm thinking for example Britney Spears or Amy Winehouse struggled with similar problems and were not treated very sympathetically. CRAGG: Yeah. Social media has completely changed the pop landscape. You know, there was no outlet for these pop stars to even sort of go against what was being said about them in gossip columns or in tabloids. They had no means to sort of immediately put these things to rest. And obviously, things were very different in terms of, you know, you were living your dream to be a pop star at that point. You were sort of meant to be this kind of, like, robotic sort of glamorous pop entity that wasn't really a human being. It was like a form for us to escape through your music. And you were there onstage living your best life. And, you know, we all wanted to be you. But that isn't like that anymore. It's changed completely. You know, pop stars now need to make it very plain that they are human beings who will fail and have frailties because if they don't, Twitter is also on the flip side there to call them up when those things fall down. So there's this weird relationship. SHAPIRO: Demi Lovato's transparency has also come through in her music. She released a song earlier this year called "Sober" where she talks about relapsing. LOVATO: (Singing) Mama, I'm so sorry I'm not sober anymore. And, Daddy, please forgive me for the drinks spilled on the floor. To the ones who never left me, we've been down this road before. I'm so sorry I'm not sober anymore. SHAPIRO: Such a contrast with all the pop songs about getting drunk and wasted, partying, you know, forgetting what you did the night before because you were so blackout. CRAGG: Yes, exactly. And I think this song is an open letter in song form. It's a literal apology going through her family, her friends, her fans. It was her way of telling them that she had failed and that she was sorry. But it's an incredibly moving thing to hear someone detailing it like that, but also for her fans to sort of accept that because that's what they're used to from her. It's always been there in her music. SHAPIRO: Michael Cragg is a music journalist and editor of Beat. Thanks for speaking with us today. LOVATO: (Singing) I don't know, I don't know, I don't know, I don't know why I do it every, every, every time. It's only when I'm lonely. Sometimes I just want to cave, and I don't want to fight. Transcript provided by NPR, Copyright NPR.